Closer magazine published a photograph of Julie Gayet driving her car, which is considered a private place under French law. 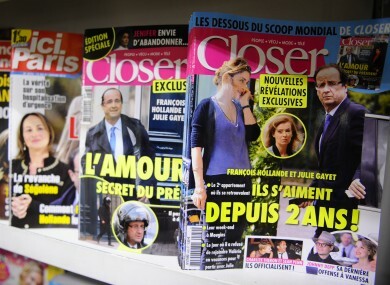 Closer magazine in France which broke the news of the affair between Hollande and Gayet. FRENCH PROSECUTORS HAVE launched a criminal investigation into the publication of a photo of actress Julie Gayet, whose affair with President Francois Hollande made global waves. The preliminary probe into invasion of privacy — an offence that can be punished with a year in jail and a fine of €45,000 — follows a complaint made by the 41-year-old actress over the photo of her driving a car published by Closer magazine, prosecutor Robert Gelli said. Gayet has played a central part in the soap opera that has gripped France for weeks since she was snapped arriving for secret trysts with the president just yards from his official residence. Shortly after the scandal broke last month, Hollande split with his long-term partner Valerie Trierweiler. Gelli said the probe would focus on a picture taken of Gayet driving her car — a private place under French law — in a follow-up Closer report on the scandal published one week after the magazine first revealed the affair. The actress has also launched a civil privacy complaint against the magazine for publishing the photos that revealed her affair with Hollande, which were all taken on a public thoroughfare outside the flat where the two used to meet. In that case, she is seeking €50,000 in damages and €4,000 in legal costs. Gayet has kept a low profile since news of the affair broke and friends have told various media outlets that she has no desire or ambition to become first lady. She has since been nominated for a Cesar, the French equivalent of an Oscar, for playing the role of a mini-skirted adviser to a minister who uses her seductive powers to get what she wants. The divorced mother-of-two is also expected to appear on the red carpet at the Cannes film festival later in the year, having provided the voice of Grace Kelly for the French version of “Grace of Monaco”, a biopic starring Nicole Kidman. Email “Criminal investigation launched into photo of Hollande's alleged lover”. Feedback on “Criminal investigation launched into photo of Hollande's alleged lover”.